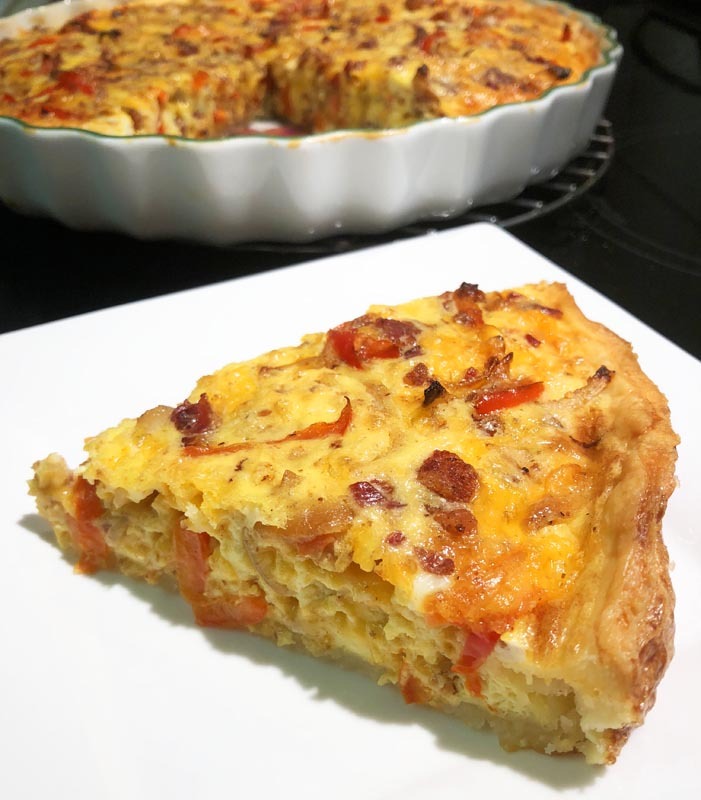 Similar to a loaded baked potato, this loaded gluten free quiche is a treasure trove of decadence. 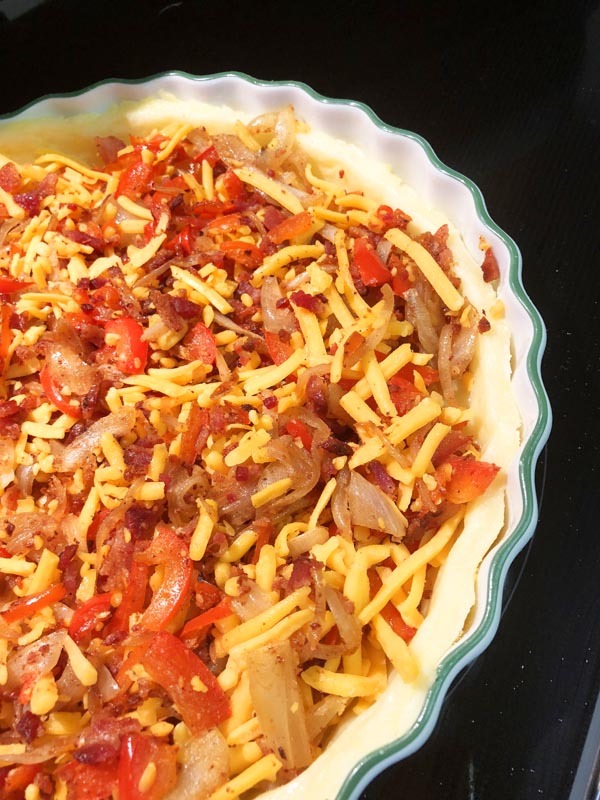 Bacon, caramelized onion, sauteed red peppers, cheddar cheese, and cream (or sour cream) make this quiche amazing. 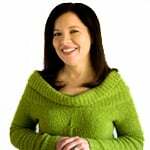 However, the flaky easy-to-make Gluten Free Cream Cheese Pastry Crust with its tender and flakiness is the shining star of this dish. However, it does not detract from its flavorful filling. Appetizers: You can even bake this using a mini cupcake pan to serve as appetizers. In this case, finely chop the vegetables. 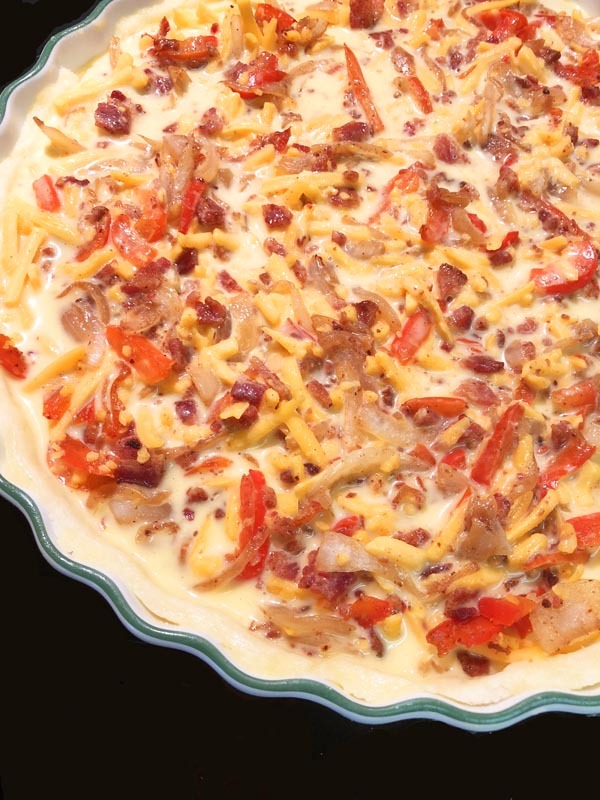 The most flavor-filled quiche you can imagine with different textures blended together. Add my flaky and tender easy-to-make pastry crust and you've got yourself a sure praise-earner. Follow the instructions at the above link to make the gluten free pastry dough and par-bake for 15 minutes at 350ºF. Alternatively, use the pastry or pie crust of your choosing. 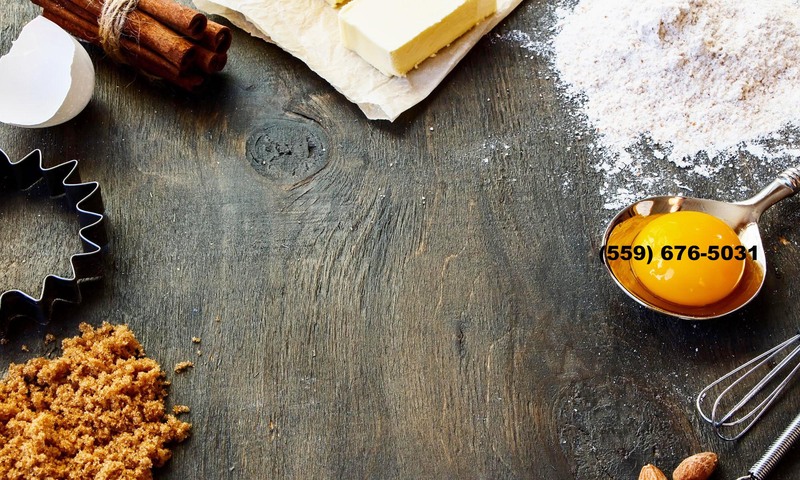 If using a different crust, be sure to follow your recipe for par-baking and baking with filling times. Cook the bacon until crisp. Drain the grease and finely chop the bacon. Transfer to a large bowl and set aside. Add additional bacon grease if needed. Lower the heat and saute the onion passed the point of being tender. You want them to caramelize for about 20 - 30 minutes. Add the bell pepper to the onions and cook until tender, approximately 10 minutes, or to your liking. Transfer the sauteed vegetables to the bowl of bacon. Add the cheese and toss together everything in the bowl. Transfer to the crust; set aside. Add the cream, pepper, and salt to the bowl of beaten eggs. (If you're using sour cream, add one egg to the sour cream and whisk until combined. Add an additional egg and beat until liquidy, add remaining eggs, and continue to beat until thoroughly blended. Add the egg-cream mixture to the tart dish to fill in the empty spaces between the filling. Bake on the center rack of the oven for 20 minutes or until a cake tester or toothpick comes out clean. Remove from the oven, transfer to a wire rack, and allow the quiche to cool for at least 7 minutes before cutting and serving. Serve the quiche with a side salad.